5.0 Running Amps - 110/115 volts. 10.2 Running Amps - Ships standard 110/115 volts. If you want 220/230 volts specify during your order. 11.2 Running Amps • Ships standard 110/115 volts. If you want 220/230 volts specify during your order. 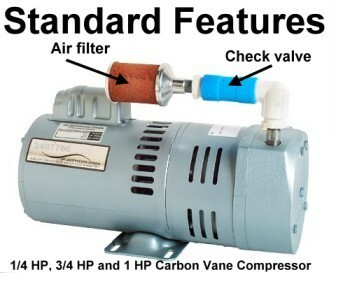 The only compressor made specifically for the aeration industry. Motor-mounted, oilless rotary vane compressors are compact, easy-to-service and excellent for moderate-pressure, continuous-duty applications. They more than double the air output of piston compressors with better longevity. Sacrificial oilless carbon vanes automatically adjust as they wear to maintain efficiency. Thermal overload protection, air filter, inlet check valve and 8' power cord is included. Ten-psi models work to a depth of 18 feet and 15-psi models work to 27 feet, depending on tubing diameter and distance. The only wearing parts are carbon vanes, which can be replaced in about 15 minutes using common tools (in continuous operation, vanes last 9 to 18 months, depending on operating pressure). All of our rotary vane compressors are performance tested and covered by a one-year warranty (not including air filters, vanes, water damage or lightning damage). Single-phase models are 115V if not specified. 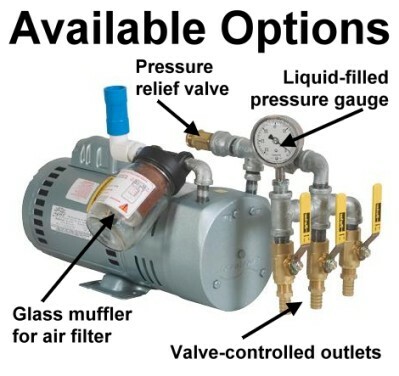 Check valves are recommended where long underwater runs of air tubing can fill with water when the compressor is off. These motor-mounted, oilless rotary vane compressors are compact, easy-to-service and excellent for moderate-pressure, continuous-duty applications. They more than double the air output of piston compressors with better longevity. Sacrificial oilless carbon vanes automatically adjust as they wear to maintain efficiency. Thermal overload protection, air filter, inlet check valve and 8' power cord is included. 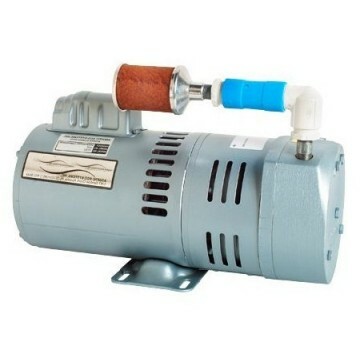 As with any rotary vane aeration compressor, from Thomas, Gast, Brookwood, Sweetwater or AquaMaster our family of rotary carbon-vane pond aerator compressor pumps are designed for continuous-duty operation. These rotary vane aeration compressor pumps are the choice for many pond aeration systems because they have a higher "Open Flow" CFM rates compared to the dual-piston or rocking piston compressors which are best suited for deeper ponds where higher pressure is needed. One of the advantageous design features of this type of pond aeration compressor is the internal carbon vanes automatically adjust as they wear to maintain aeration compressor efficiency. The carbon rotary vane compressors are also quieter than the piston pumps. Ten-psi models work to a depth of 18 feet and 15-psi models work to 27 feet, depending on tubing diameter and distance. The only wearing parts are carbon vanes, which can be replaced in about 15 minutes using common tools (in continuous operation, vanes last 9 to 18 months, depending on operating pressure). All rotary vane compressors are performance tested and covered by a one-year warranty (not including air filters, vanes, water damage or lightning damage). All air compressors are performance tested before shipping. 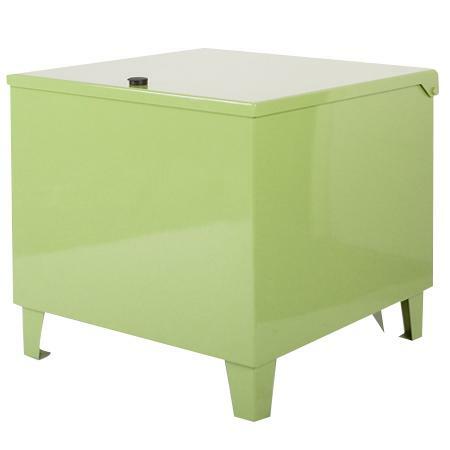 Thermal overload protection, air filter, inlet checking valve, and 8' power cord included. Wearing parts are the carbon vanes lasting 9 to 24 months depending on usage. One year manufacturers warranty on motor (sacrificial carbon vanes not included). The most durable compressor cabinets in the industry. These heavy steel cabinets are almost 1/8" thick and virtually vandalproof. They're equipped with cooling fan, soundproofing, electric receptacles, built-in locks and bottom outlet holes. The sound level is typically below 55 dB at 10' and inaudible at 50'. Dimensions: 24" x 15" x 16"